Peterborough Phantoms saw their five-game winning streak ended by one poor period last night (December 17). The city team slipped to a 4-2 defeat at Guildford in the English Premier League with all of the Flames’ goals arriving in the opening session. Phantoms were caught napping as Tuomas Santavuori made an early breakthrough before fellow Guildford import Marek Maslonka helped himself to a brace. And a fourth strike for the hosts, from Andrew Hemmings, with 18 seconds of the period remaining, all but sealed their success. 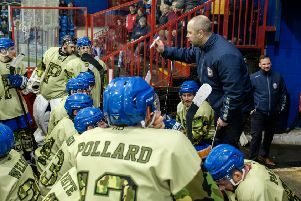 Phantoms, under the control of temporary coach Jason Buckman with Slava Koulikov away on international duty, did improve as the game wore on to reduce their arrears with a goal in each of the remaining periods. Martins Susters opened their account at 25:24 before defenceman Robbie Ferrara netted with just under six minutes to go, but they left themselves with too much to do following a dreadful start. Phantoms have their final pre-Christmas fixture tonight (December 18) when entertaining table-toppers Telford at Planet Ice (5.30pm). The Tigers have not allowed financial problems, which have led to the departures of a host of players, to affect their form on the ice - winning nine of their last 10 games since a 4-1 reverse in their previous visit to Bretton last month. Koulikov is due to return to lead Phantoms tonight after his stint with the Great Britain Under 20 team at their World Championship event in Hungary, which came to an end last night. Defenceman Tom Stubley and forward Connor Glossop have also been away with the national party, who were relegated after losing all five of their games in the Division 1B event.